To my surprise, there is still a lot of confusion about the different types of tyres you can fit on your bicycle, so I thought of writing a simple guide with pros and cons for the benefits of those who still feel a bit perplexed. There are currently three types of pneumatic tyre on the market: clincher, tubeless and tubular. Clincher and tubeless tyres are in many ways the same thing, as they are both open tyres that require to be mounted on hooked rims and are held in place by pressure. Tubular tyres are different: they are self-contained tyres which need to be mounted on specific tubular rims and are held in place by adhesives, even in the absence of pressure in the tyre. As for what is best for what, please bear in mind I can only offer my perspective, having extensively ridden all three, but I am sure there are folks out there who see things differently and will advise you otherwise. I have no particular desire to be right on this topic and I take no responsibility if following my advice you end up disappointed (or worse, in a hospital). CLINCHER TYRES: they are open tyres that need to be mounted on hooked rims and need to be paired with an inner tube, which is airtight and can be inflated via a valve. If you bought a bike, 99% of the times it will be fitted with clinchers. PROs: clinchers are the most common type of pneumatic tyre for bicycles. This means they are cheaper and most cyclists are familiar with the way a clincher is fitted, removed and how an inner tube is replaced. Inner tubes are extremely cheap and small enough to carry around, making puncture repairs easy and cost effective. CONs: clinchers are very popular, but they have the most severe drawbacks, in particular they can jump off the rim if they lose pressure as a result of a puncture. Conversely, they can blow off the rim if the pressure gets too high as a consequence of over-heating due to extensive braking. TUBELESS TYRES: tubeless tyres are a variation of clinchers that do not require an inner tube. They are manufactured with a tighter and stronger bead and using a rubber mix that make them airtight. As a result, they are currently 20-30% heavier than the corresponding clincher, although that difference is often offset by the absence of an inner tube. They need to be paired with hooked rims that have a tubeless section with ramps, like the one in the cartoon. The ramps are important, as they stretch the tyre bead and allow it to seat correctly and prevent it from jumping off the rim in case of a loss of pressure. There are various tubeless standards, like UST and TLR, but as a rule of thumb they are of no practical use to you and most likely a question of liability of the manufacturer. The rim is made airtight by the absence of holes, or by fitting an airtight rim strip. It is important to use only tyres that are marketed as tubeless, as standard clinchers are likely to blow off the rim if mounted in the absence of an inner tube. PROs: they offer improved rolling resistance, as no energy is lost in friction between the different layers. If paired with a latex emulsion they offer excellent puncture resistance, as any hole will activate the sealant liquid, that typically seals the puncture in seconds with minimal loss of pressure. The tighter fit, if combined with a tubeless rim with ramps, ensures the tyre will stay on the rim even in case of loss of pressure, making them safer. Tubeless tyres can be run at a lower pressure than the corresponding clinchers, increasing grip and safety. CONs: the market for road tubeless tyres is still in its infancy, which means limited choice and high prices. Things are beginning to move in the right direction, but they are still premium tyres and not the ideal choice for commuting or training tyres. The fit is more time-consuming and labour intensive than standard clinchers. TUBULAR TYRES: these are not open tyres, they are stitched at the base into a cylinder and contain an inner tube, made of latex or butyl rubber. They need to be mounted on a tubular specific rim by means of a tyre glue or an adhesive strip. Tubulars are the tyre of choice for high-end and professional racers. PROs: tubulars are the safest tyres to ride on, as they will stay glued on the rim even in the absence of pressure. 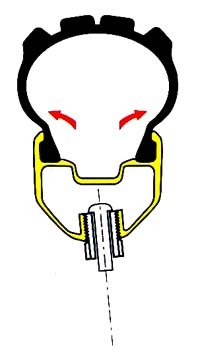 In addition, the absence of a hooked section means rims can be made lighter and stronger. Moreover, overheating and increased tyre pressure will not result in a tyre blowout, although the glue might still lose efficacy if the temperature is excessive. CONs: tubulars are generally expensive, time-consuming to fit and even more to repair. They can be filled with sealant liquid to prevent punctures, although the sealant cannot be removed and it might over time jam the valve or form lumps inside the tyre. The market for tubular rims is limited to carbon fibre, with only a handful of aluminium rims still available. For these reasons, they have to be considered a race day only tyre.